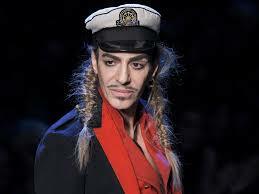 John Galliano is a British fashion designer and by far one of the most talented and controversial designers in the world. He was born in Gibraltar and moved to Streatham, South London when he was six. He graduated from St. Martin’s School of Art, the top fashion design school in London, and became an instant star. His style was hyper-romantic and passionate, but he also displayed a meticulous attention to the details of tailoring that set him apart from his experimental peers. He was the head designer of Givenchy (1995-1996), Christian Dior (1996-2011) and his own brand John Galliano (1988-2011) before he got drunk, went on an anti-Semitic tirade in a dive bar, was caught on videotape, and got fired from his job and shunned by all his friends. He later apologized for being blasted out of his mind and everyone forgave him. He has since become the creative director of the Paris luxury fashion house Maison Margiela. From the beginning of his career, Galliano was captivated by Chinese culture, and has used touches of it in several of his early collections. Yet, the influence of Chinese fashion is hardly static in Galliano’s work and changes, in my mind for the better, as he has come to have real contact with actual Chinese people and culture. So what started as a childish infatuation with Chinese movie posters has blossomed into an engagement with the real China. And that’s the story I want to tell, his movement from a fantasy China to a real one. This is not something that Galliano doesn’t understand. In an interview with Andrew Bolton for the exhibition “China: Through the Looking Glass” at the Metropolitan Museum of Art in New York, Galliano talks a lot about Chinese fashion and the impact of Chinese aesthetics on Western fashion: “Travel is a critical aspect of my creative process.” His first visit to China lasted 3 weeks and he spent almost all of it soaking up the street life. 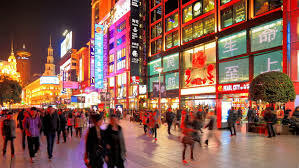 The streets of Shanghai at night are bathed in the light of red lanterns and the orange sun sets in a gray sky over red temples with green and blue-tiled roofs. In Beijing, the contrast between old and new architecture is startling and is something that a mind like Gallino’s would love, the contrast between radically different elements. Galliano saw it all and we can see how a real engagement with China changed his work from 1998 to 2003. You can see a huge growth in Galliano’s Chinese inspired work from his first attempts in his Fall/Winter 1998 collection and to his Spring/Summer 2003 haute couture collection for Dior. Both are Chinese-inflected, yet we can see the tremendous development in Galliano’s understanding and use of Chinese elements in just five years. It’s a tribute to experience and creative growth. In Fall/Winter 1998 collection, there is a pink silk jacquard dress, which looks like the Qipao from the Qing dynasty that ended in 1911. The dress has multiple layers, but the smooth fabric counteracts that to create a drape that is both unified and dramatic. It is trimmed with black silk satin flowers that mimic traditional Chinese patterns. In addition, Galliano includes heavy hems that give the dress a heft and weight. But the Chinese style is limited to the cuff and hem, which is a kind of surface appropriation. The rest of the dress is typically western: It has the silhouette of A-shape with a high waistline, and is long to the ankle. The top part of the dress is fit to the body with tight and long sleeves, which has the western style of a little bubble shape at the shoulder, and the bottom skirt part is spreading out from waistline. So, we can intuitively feel that Galliano’s use of Chinese fashion is just decorative, the same as if the influences were Italian or Brazilian. It almost doesn’t matter that it’s Chinese. Maybe the dress was interesting and innovative in 1998, as China was just coming into greater force and world consciousness, but it seems no more than a lot of little details now. Although the Chinese elements were not from the most significant pieces in the collection, he continued to develop, explore, and employ Chinese styles. There is a green ensemble in the collection of spring/summer 1999, which is composed of a silk shantung jacket and pleated skirt of silk jacquard. The ensemble is elegant and fit to the bodyline, especially the tight jacket. Multiple Chinese buttons are lined up with red silk satin piping at the center, which is connected with the typical Chinese style of a standing collar. The dress is really feminine, but has dashes of the masculine in it, especially the military stars and metallic gold frogging. It’s wearable, elegant, and shows off the female body. The jacket is tight at the top, but descends to loose, comfortable, and graceful long pleated skirts. To me, the dress looks like a puzzle, which is composed of several Chinese elements, such as the obvious green for the military, Chinese buttons, and a standing collar. Each of these elements alone is just a wink towards Chinese style, and we can see how Galliano is attempting to truly incorporate Chinese aesthetics into his work, but he isn’t there yet. After visiting China, Galliano’s work changes. In the collection of Spring/Summer 2003, he uses the Chinese and Japanese elements as the main focus of his design. The polychrome silk brocade dress here definitely shows a distinctive Chinese style. The color of red and gold and the circular prints are traditionally Asian. The exaggerated puffy silhouette is composed of multiple layers that keeps you guessing how they’re connected. The whole dress looks like a costume from an opera. The asymmetrical sleeves balance the use of heavy and light fabrics. It’s not a puzzle or a game anymore, but an expression of Galliano’s engagement with Chinese culture. Another dress from the collection also uses an exaggerated silhouette. The use of pinks, golds and reds give the garment a Chinese overlay. Some people think that the fabric prints he used not only related to China, but also referenced Japan. The Asian influences are no longer limited to a certain area, but combined and filtered through his continuing engagement and interest with the entire area. We can feel how this melding of East and West frees Galliano’s creativity. The work isn’t merely gestures, but a sense of unification. As we compare these two collections, we can feel how much Gallian grew as an artist over those five years. As Galliano rested for two years after his drunken, anti-Semitic outburst, he joined Maison Margiela and was back as the lead designer at a major house. No one can deny his talent, but some people doubted that the passionate and colorful Galliano fit into Margiela. However, Galliano continued to produce avant-garde designs with unconventional materials, which is the core of his work. Although he has not yet returned to Chinese inspired work, one hopes that he will continue to look to the East for inspiration.